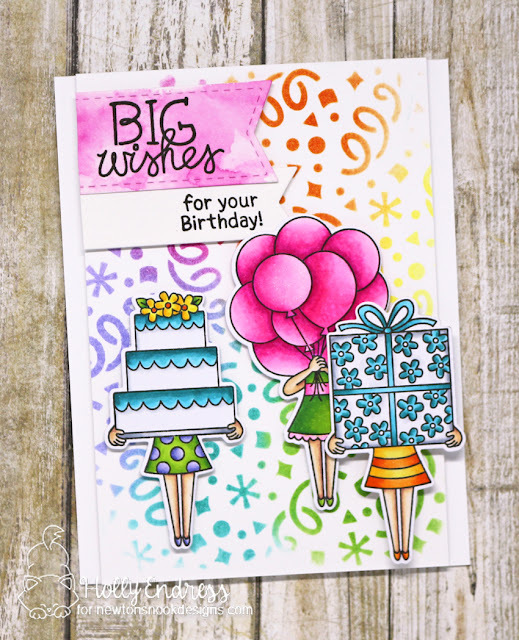 Hollybeary Creations : Big Wishes!! Happy Tuesday everyone... I hope you are having a great start to the week so far. I'm up on the Newton's Nook Blog today with these Fun Big Wishes card. I created the background on a piece of watercolor paper using the Confetti stencil and several shades of Distress Inks. Then I trimmed a 1?4 in off each side and adhered it to a top folding A2 size card base. I stamped the images from the Holding Happiness Stamp set onto some X-Press It blending cardstock and colored them in with Copics that matched the ink I used on the background. 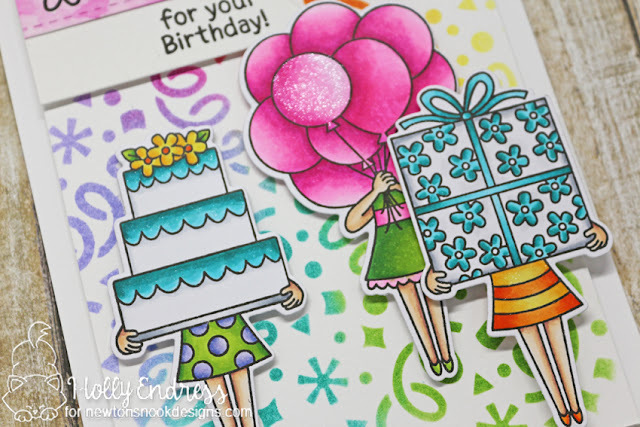 I used the coordinating dies to cut the images out and then I adhered them to the front of the card with foam tape. I die cut to Banners from some White cardstock using the Frames and Flags Die set as well and I added some Picked Rasperberry Ink to the larger one. Once that was dry I stamped the sentiment in Black ink and layered the banners with foam tape. I wanted a little pop of Sparkle on the card so I added some Clear Wink of Stella to several parts of the images. This gave it just a little sparkle without taking away from the background. Thanks for stopping by today... Head over to the Newton's Nook Blog for more inspiration from the team. Oh my gosh, Holly...this is amazing! So colorful and festive. The wink of stella is perfect!